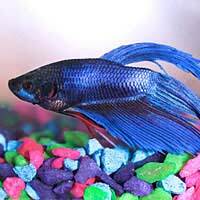 Among the most famous tropical fish are bettas also known as Siamese fighting fish. The dramatically coloured males of the species are often sold singly, but, properly managed; they can make an attractive addition to your community fish tank. Siamese fighting fish possess a specialised breathing organ called the labyrinth organ. This enables them to consume air very efficiently, enabling them to survive in the wild in small pools which heat up until there is little available oxygen in the water. For this reason it is normal for them to gasp at the surface in the aquarium, and this behaviour shouldn't worry you as it would with other fish. Whatever you keep them in, it's important to make sure that your bettas have access to the surface so that they can breathe properly. Over the past few years a fashion has developed for selling male Siamese fighting fish singly in very small bowls or even in flower vases. This is not a suitable environment for a fish. Bettas need quite warm water and the smaller their environment, the more difficult it is to control the temperature. It is also harder to maintain a proper ecosystem and keep water pollution under control. Furthermore, although they are less active than many kinds of fish, they still need room to swim about in order to be happy and healthy. Bettas are relatively easy to breed in captivity, but if you're going to be successful you'll need to go about it carefully. The first thing to note is that Siamese fighting fish can be aggressive when spawning just as they can in their treatment of rivals, so choose a pair of about the same size to reduce the chance of one seriously injuring the other. You'll need to set up a separate spawning fish tank for them and introduce the male to this first so that he sees it as his territory. The fish tank should contain plenty of plants for the female to hide among. Adding a piece of curved plastic or Styrofoam will provide the male with an ideal site to start building a bubble nest. With bettas, it is the male who takes care of the eggs and fry. After the eggs have been laid you should remove the female in case she starts to eat them. Treat her with a mild antibiotic to prevent infections in any wounds she has received (which may be too small to see) and treat the spawning tank with an anti-fungal agent to protect the eggs. You should then cover the spawning fish tank with cling film or similar in order to keep the air above the water's surface as warm as the water itself. Cold air can cause pneumonia in newly-hatched fry when they rise up to eat it. After they are born, the male will usually continue to look after them, but sometimes, under stress, he will start to eat them, so you should keep him under careful observation. You should also be ready to separate the young male Siamese fighting fish from the aquarium when they start to become aggressive towards each other. Betta fry can usually be fed on newly hatched brine shrimp, but may benefit from a special fry food preparation. Bettas are complex and interesting fish with much more going on than just aggression. If you take good care of them, you'll find lots of pleasure in observing their unusual habits in the aquarium, and you'll find them highly rewarding fish to keep. @Thisaldome - it could be a variety of reasons. One is that sometimes when fish are scared they may lie on their sides in the on the bottom of the tank until they sense the danger is passed. However, if it has lost its appetite then it is probably another cause. Bettas can also be sensitive to changes or problems with the water temperature and chemistry. They a need warm stable water temperature of around 78*F – 80*F. You also need to beware of toxins building up in the tank if it is small. I think you need to do some further specialist research to assess whether it is a real problem, or whether your fish is just acting on its fighting instincts. Ste.